Coming soon: CPF North Vancouver’s annual French Film Festival! On Thursday, February 27, 2014, over 1900 French Immersion students and 100 teachers and volunteers from North Vancouver and West Vancouver schools (Cleveland, Ross Road, Sherwood Park, Braemar, Larson, Argyle, Handsworth, Windsor, Pauline Johnson and Cedardale) will be converging on Empire Theatres Esplanade to watch three fun and engaging French films! 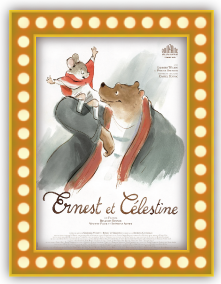 Ernest, a busking bear, and Célestine, a boho mouse, forge an interspecies friendship and instantly become a cause célèbre in this thoroughly entertaining and slightly demented adaptation of Gabrielle Vincent’s French children’s books. 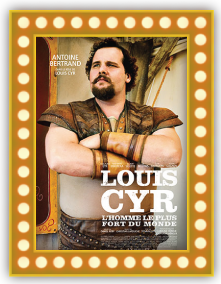 This is the story of real-life champion weight lifter, Louis Cyr from Quebec, who was promoted as the strongest man in the world in the late 1800s and early 1900s. Cyr’s beginnings were difficult, his Quebecois family plagued by poverty and illness. Despite the constant hardships, Louis presents a ray of hope with his Herculean feats of strength. His gift leads the young man to a career as a strongman in North America and Europe. This cheeky, coming-of-age comedy set in Quebec tells the story of 11-year-old Ricardo, who in 1981 struggles to fit in at his new school. With a flare for inventiveness and a desperate desire to impress his richer classmates, Ricardo weaves a web of untruths, which he must carefully maintain to keep up appearances for his new friends.